Currently viewing the category: "Gear Reviews"
Members of TeamHalfwayThere displayed and demonstrated Stan’s products at a bicycle commuting education event at U.S. Coast Guard Headquarters. Michael Dickey displayed custom wheels based on Stan’s ZTR Crest rims that he built for his adventure racing bicycle as well as a new pair of the gorgeous and unbelievably lightweight Valor carbon wheels. Demonstrations included applying Stan’s rim tape to a mountain bike wheel with a Stan’s rim as well as converting a set of 700c road wheels to tubeless using Stan’s conversion kit and Hutchinson Sector tires. The event was attended by a number of regular bicycle commuters and some interested in starting commuting by bike. 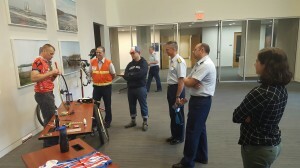 RADM Marshall Lytle, the Coast Guard’s CIO and an experienced bicycle rider and commuter attended to offer his support. by T.J. Hoff I use and recommend the Crank Brothers eggbeater pedal in Adventure Racing because they are easy to install, simple to maintain and can take a beating on the trail. When I started mountain biking I didn’t have clipless pedals, but as I became more comfortable with riding, I upgraded to the Crank Brothers mallet pedals. Air Jordan 7 I chose these because, at the time, I wanted a platform pedal for stability, but still gain the advantages of clipping in. nike air max 2016 online I later upgraded my pedals to the eggbeaters and have not turned back. nike air max 2017 wit What I really enjoy about the Crank Brothers pedals is their simple design approach. Maglia Clyde Drexler Their cleats are very well engineered, light and super durable but yet small enough to tuck up in the cleat pocket to allow for dismounted walking and hike-a-biking, which is inevitable during Adventure Racing. They provide just enough float and don’t have complex adjustments for dismount angle. Fjällräven Kånken Just flip the cleat around and your angle for unclipping is changed. air max pas cher The pedal itself is a very durable pedal with a simple design which makes it VERY easy to maintain and rebuild. cheap fjallraven kanken sale With a few simple tools you can have your pedals looking and feeling like new within minutes. adidas sale uk As an Adventure Racer I would recommend the Crank Brothers eggbeater pedal because of its reliability, small cleat footprint, durability, and simplicity, all of which are important when racing in unfamiliar areas.